A team of astronomers has discovered indications of water clouds in the coldest known brown dwarf, which is located 7.3 light-years from Earth. Astronomers have found signs of water ice clouds on a brown dwarf located just 7.3 light-years from Earth. If confirmed, the discovery is the first sighting of water clouds beyond our solar system and should yield insight into the nature of cool giant planets orbiting other suns. Using images from NASA’s WISE infrared space telescope taken in 2010 – 2011, astronomer Kevin Luhman (Pennsylvania State University) discovered the brown dwarf named WISE J0855-0714. This brown dwarf is the coldest known and it has a temperature is slightly below the freezing point of water. Since the discovery of WISE J0855-0714, scientists have found that it’s as large as Jupiter with three to ten times the mass. 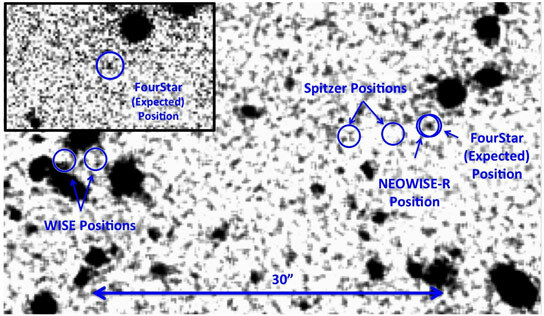 The new study, which has been accepted for publication in ApJ Letters, details how the researchers used the FourStar imager at Las Campanas Observatory to acquire deep near-infrared images of the newly discovered brown dwarf. Astronomers await the launch of the James Webb Space Telescope to help verify the discovery. 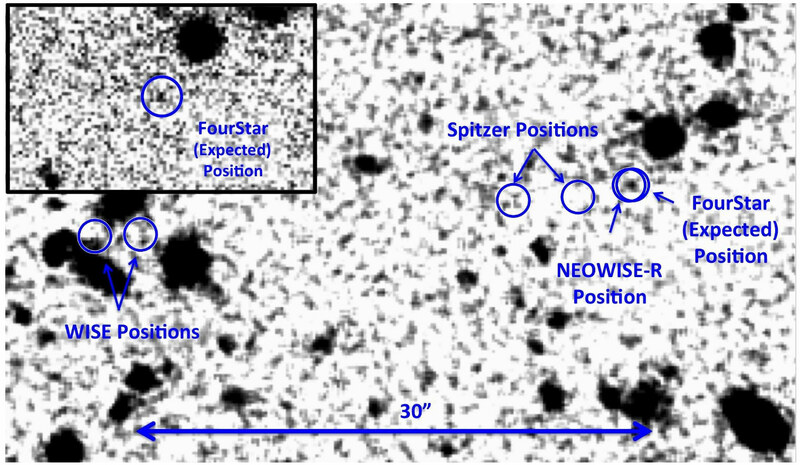 Be the first to comment on "Indications of Water Clouds in a Brown Dwarf 7 Light-Years from Earth"